Since I am going back to Vancouver for a short vacation, I need to get my driver’s license as well as my international driver’s permit (IDP) so that I can drive in Vancouver. I no longer have a driver’s license in Canada as I am no longer a resident of Canada. That means I need to get my IDP to legally drive in Canada. As far as I know, it is completely legal unlike in America. I recently heard that US citizens must have a valid US state issued license in order to drive in America. Having a Japanese license with an IDP is not allowed. This seems strange as it is impossible for a US citizen living abroad to be able to drive in America on vacation as they are ineligible to get a state issued license and even if they did have a Japanese license with an IDP, they are not legally allowed to drive in America. Luckily I have no such problems. The only problem I had was getting information into how to get my IDP. Finding information in English on how to get an IDP is a tricky process. All of the English websites talk about getting an IDP for the purposes of driving in Japan, rather than getting an IDP for a Japanese driver’s license. Thankfully the Saviour helped a lot and I was able to get it pretty easily. The first step in getting and IDP for your Japanese driver’s license is to get all of the required documentation. You are required to get a 4cmX5cm photo of yourself, your passport, driver’s license, any old IDPs you had issued to you, and money. There were only 3 places that I knew of where you can get an IDP. 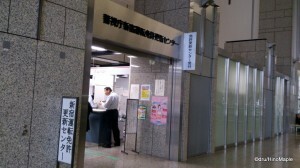 The trusty old hell on earth, also known as the Samezu Driver’s Licensing Center, the Koto Driver’s Licensing Center, and the Shinjuku Driver’s Licensing Center. Obviously I avoided going to hell on earth and went to the Shinjuku centre. It is also because I sometimes teach in Shinjuku making it the easiest location to visit. Rather than riding my bicycle all the way to Toyocho, I just walked over from where I was teaching my lesson. Unfortunately, I also learned of about 5 other centres where I could have gotten my IDP. The process of obtaining the IDP is pretty simple but for a foreigner with limited Japanese reading ability, it isn’t the easiest thing in the world. The first problem is getting a photo taken. You must have a photo that is 4cmX5cm, as I mentioned. This sounds a lot easier than it is as most photo booths do not have photos that are that size. The Shinjuku driver’s centre did have a photo booth that does provide photos at that size for 700 yen. I decided to go to one near my house which produced photos that were a bit larger but it suited my needs and they weren’t picky about it. I then proceeded to do the general run around of going from window to window to complete my task. Step one was to go to none other than window 1. This is more of a counter with a number on top of it. 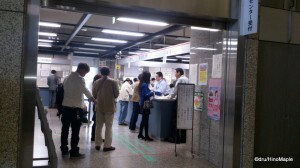 Basically it is the information desk where they hand out the forms you need or direct you to the places you need to go. 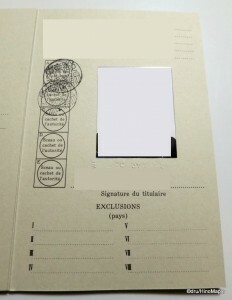 This involved taking a scan of my license where they could print out the form with my license also printed onto the form. It was pretty quick and painless. Then came filling out the form itself. I had to fill it out and I could fill out about 40% of the form on my own due to my limited reading ability. Being partially illiterate in Japan is pretty tough at times. The typical date, name, birthday were easy. Figuring out the rest was a painful experience. I should have asked for the English form which is a simple copy with some instructions on it. The information that I didn’t fill out was my place of birth, destination, duration of my stay, as well as purpose of my trip. From what I can gather, you must get a new IDP every time you travel, but the IDP is valid for 1 year from the issuing date. I proceeded to window 4 which is the cashier’s booth. This was pretty simple. I gave my money and they printed out the payment stamp. I then proceeded to booth 3 and they handled everything for me. It only took about 10 minutes to do everything, and the bulk of my time was spent just trying to get the form filled out. If the Saviour was with me, it would have been faster, but during office hours, I had to do it alone. No problem as they did have a little guide to help out. Unfortunately I didn’t take a photo of it to help you, or even to help myself for the future. I was a little scared that photos weren’t allowed and I needed my IDP. As long as you have all of your forms and your old IDP, as I had one, you shouldn’t have any problems. I’m not even sure if they had a record on my file that said I had an old IDP so I can’t say if they will even ask you for it. It is pretty simple to do and they are relatively helpful. I vaguely remember all of the steps I went through in the past but not in complete detail. Once you are done, you just get your license, passport, and IDP and you can take off. Aside from waiting and doing the whole magical windows act, it is painless and simple and anyone can do it. 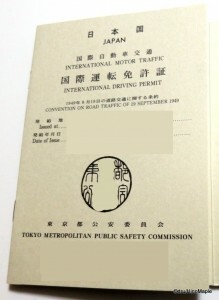 This entry was posted in Automobiles and tagged Driver's Licensing Office, Driver's Permit, driving, IDP, International Driver's Permit, japan, Koto, Samezu, Shinjuku, tokyo by Dru. Bookmark the permalink. It *is* fun in Japan, compared to the indescribable horrors of Africa’s government offices!!! Guess I should be happy? I just wish I could do it all online and save the hassle. At least I can surf the internet while I wait. PS: Lina, do you think Dru realizes that we’ve been discussing his firefly fundoshi again?! What? Talk about my future fundoshi? Where? I haven’t seen that yet. Do I have to scour Lina’s blog? Just go find a post where some awesomely pert and tight butts were shown. Be glad that it wasn’t flabby butts that made us think of you and your fundoshi! bwahaha!!! !